New meets old within this fully wrapped mahogany library/drawing room. Woodleaf Studios took two rooms from this historic home and made them into one. The original wall separating the two rooms was replaced with a balanced group of columns and pilasters. The coffered ceiling provides elegant character and depth. There are concealed wall panels engineered to allow access to mechanical systems. 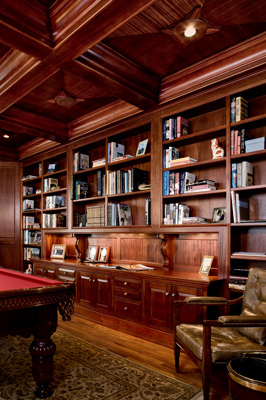 This elaborate room also has integrated cabinets and bookshelves. The north end of the room is tailored around a large flat screen TV (see image 03).